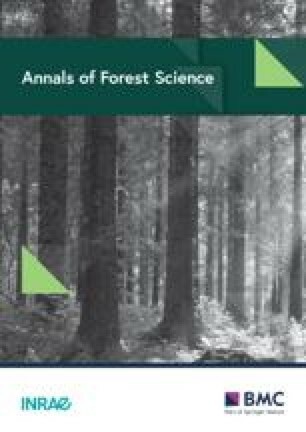 • The aim of our work was to homogenise the meteorological dataset of German ICP Forests Level II sites (n = 73) by the aid of interpolations based on climate data from the German meteorological network (DWD). • For each site daily values of climate variables (temperature, precipitation, solar radiation, relative humidity and wind speed) were interpolated by ordinary kriging after the removal of global trends for each day over a period of 11 y. The quality of the method was estimated by cross validation. The standard normal homogeneity test for single shifts was applied repetitively to detect inhomogenities in all time series (n = 594) using the interpolated dataset as reference. • Our results indicate that: the accuracy of the interpolation method was highest for maximum air temperature and lowest for wind speed; homogenisation improved the quality of the climate time series and had the largest impact on solar radiation and wind speed; the correlation of interpolated and measured climate was stronger within the DWD network than within the ICP Forests Level II network, due to a generally higher variance (precipitation) or a systematic deviation (wind speed, minimum air temperature). • We suggest the use of external climate data for homogenisation procedures within the quality assurance/quality control of the ICP Forests Level II programme. The high prediction errors of precipitation and wind speed demonstrate the need for the on — site survey within the monitoring programme. This manuscript issues from a presentation at the LWF conference, Zürich, September 2009.